Grassroots Farm & Dairy – Apprentice Orientation: Transitioning from Apprentice to Farmer. Each year, the OGS CRAFT network facilitates an Apprentice Orientation designed to address the topic of transitioning from apprentice to farmer. Panelists that represent the large breadth of approaches to this transition are invited to speak, and apprentices from our CRAFT member farms are encouraged to participate in an open Q&A format. The apprentice orientation is important for OGS and for CRAFT apprentices; it honors the work our apprentices do in our area to support and continue small-scale, sustainable agriculture practices, as well as addressing this very important topic pertaining to the continuation of the future of farming in WNC to be discussed. In attendance were apprentices from Goldfinch Gardens, Ivy Creek Family Farm, and Full Sun Farm. This years’ gathering was held at Grassroots Farm & Dairy, a developing sheep dairy in Marshall, NC. Andrea and Tim, Grassroots’ farmer owner/operators, along with Ryan Clark of Fiddler’s Green (est. 2014) and Krista and Stephen of New Roots Market Garden (est. 2016) joined us for our panel, each with different approaches of transitioning from apprentice to farmer. Andrea and Tim have many connections with the sustainable agriculture industry in WNC. Andrea apprenticed on 3 farms (including Thatchmore Farm) in WNC before she started her own small-scale vegetable operation, and has been an active participant in CRAFT events for many years. She believes very strongly in the power of finding farmer ‘mentors’, and has managed to do so for herself through the CRAFT network. Andrea didn’t care so much what she was farming as long as she was farming. 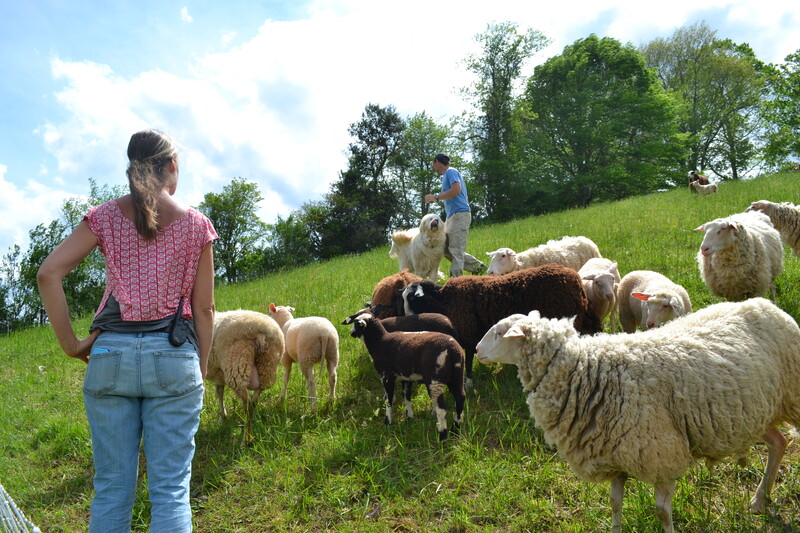 So when her husband, Tim, embraced a nostalgic love of dairy sheep stemming from his experience growing up in Spain, they jumped on the idea of establishing a Grade A sheep dairy in WNC. Andrea & Tim are being slow and methodical about their approach during what they call the “money, time and infrastructure crunch” that happens at the beginning of every non-established farm owner’s transition. They have not yet started selling dairy off the farm (they’ve now been on the land for about a year), but hope to be at the beginning of next season. Instead, they use a lot of their farm products (sheep skins, eggs, broilers) for barter, to help with the infrastructure development on their land. They both still work part-time at jobs that, thankfully, they can do from home. Andrea and Tim believe strongly in the importance of learning from experienced farmers. They encouraged the apprentices in attendance to take advantage of their opportunity as much as possible — ask them how and why they did things, and learn from their mistakes. Ryan Clark, owner/operator of Fiddler’s Green Farm, had a very different experience farming. “I never apprenticed,” he explained; he found paid hourly farm work in New England, and then after a few season he was hired as a crew manager at Ivy Creek Family Farm. A big part of learning for Ryan has been learning through other people’s mistakes. After a lot of trial-and-error as a farm manager, he decided to buy land in Marshall and begin farming for himself. Fiddler’s Green is a 3-acre mixed vegetable operation, that also incorporates broilers and laying hens into their enterprise. His biggest hurdle has been the discovery that as a farmer, you also have to be a business person. Not only do you have to grow the things, but you have to know where to sell them as well. He’s farming primarily alone with a single employee, so he has to juggle all of the aspects of farm ownership including being his own salesperson. Krista and Stephen moved to WNC to apprentice at Goldfinch Gardens last spring, after a few years volunteering on farms in Maryland. After their first farming season in WNC, Krista and Stephen started Farm Beginnings, OGS’ year-long Farmer Business training program, which has helped them with the marketing and business side of things. Farm Beginnings curriculum covers topics from financial management to marketing; “Plus, it’s been really great to surround ourselves with other people who want to be doing the same thing we want to be doing,” explained Krista. Opportunities later arose for them through the CRAFT network (where they found land available to lease, the same plot previously leased by Andrea’s vegetable operation!) and instead of continuing on a second year to manage Goldfinch, decided to take the plunge and lease one acre of bottomland. It’s been a challenge for them to get into tailgate markets in Asheville, as vegetable farm booth slots are limited and competitive. They were able to secure a space at the Wednesday French Broad Food Co-Op Market, and have been doing well there. Their rent is minimal and only due quarterly, so Krista’s part-time job has managed to help them float their expenses. “One important thing to do as you begin your own farm is ask yourself, ‘What level of risk am I willing to take?’ What are you okay with as far as comfort goes?,” explains Andrea. All of the panelists represent different levels of risk-taking: Andrea and Tim on one end, still relying heavily on their off-farm jobs and methodically building up to the sheep dairy of their dreams, and Ryan on the other end, who plunged into farming full-time for himself after his land acquisition. Although Krista and Stephen have been challenged by Krista’s part-time job (as she has limited time on the farm), they admit it’s been nice to “not have to bank completely on the farm as our sole source of income.” All the panelists also represent different demographics (Andrea and Tim are parents, Ryan is younger and farming alone with no children, and Krista and Stephen are also without children), which assuredly factors into their personal levels of risk taking. We’d like to thank all of the people and farms involved in this intimate sharing that happened during this panel! It was so lovely to see the quilt stitched together by all of these CRAFT farmers talking about their experiences farming in this area — endless connections and loops all surrounding this network. All of our panelists were in agreement that the best thing about farming in this area is the farming community that’s here. Thank you all for being a part of it! Are you hoping to apprentice in this area next season? Please check out our Apprentice Link listings for many apprentice opportunities in WNC.